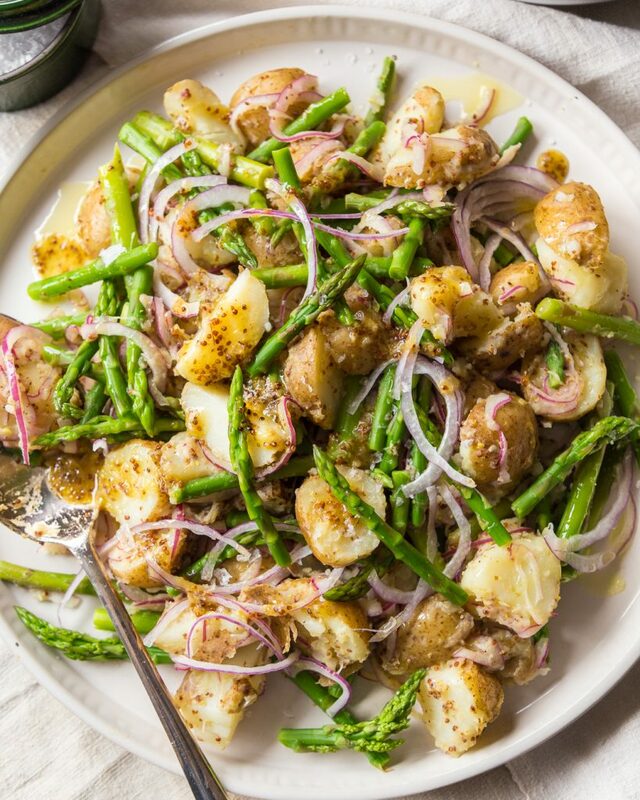 You may have caught me making this German Warm Potato and Asparagus Salad on my Instagram stories a few weeks back. If not, there should be a saved story in my ‘Highlights’ reel. It’s marked “Rack ‘o Lamb” – which is an odd title for a potato salad. 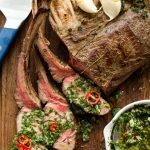 In my defence, I did serve it with a rack of lamb, the recipe for which can be found here! If you can’t watch Instagram stories on your mobile device or tablet, please try to find someone who can. On March 29, I successfully defended my PhD dissertation! Hallelujah! It still hasn’t sunk in! Most mornings I wake up feeling as though there is still research and writing to be done. Alas, I digress. My defence date just so happened to fall on the day before the Easter and Passover long weekend and Catalina’s family was coming over for a holiday dinner. 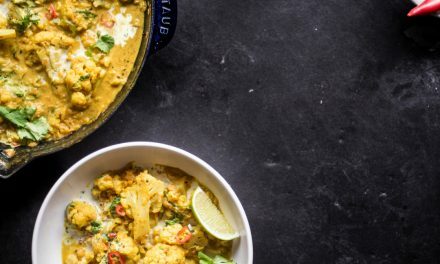 I wanted to cook something that was easy, delicious, healthy and would feed a crowd. At the same time, I wanted something that felt celebratory and would punctuate each of the holidays rolled into one. 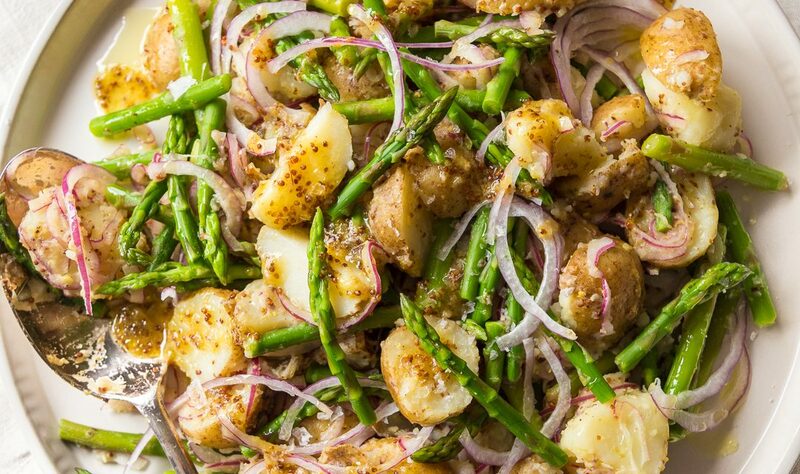 Enter this German Warm Potato and Asparagus Salad. Also enter the awesome Reverse-Seared Rack of Lamb that I served it with (not pictured). This salad ticked all the boxes and I was even able to make use of things I already had on hand. That meant that I didn’t need to make a special trip to the store for ingredients. Not to mention the fact that I also had a rack of lamb tucked away in the ice box just screaming “special occasion”! This ties into a much bigger issue that I think most people have with entertaining and that’s the idea that you have to go out of your way to make things special. Yes, you should be sourcing great ingredients for special events. But there’s no need to over-complicate things or make it unhealthy. And there’s nothing wrong with using what you have on hand. 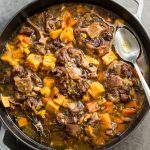 The best meals are the ones served around conversation, laughter and music and as long as you can sustain those (perhaps with the assistance of a glass or two of red wine), you and your guests should have a fantastic time. I mean, the food should be delicious too but it doesn’t need to be Michelin-star rated. You may or may not know that I do not follow a Whole30 protocol 365 days a year. I do, however, develop a lot of Whole30 compliant recipes. 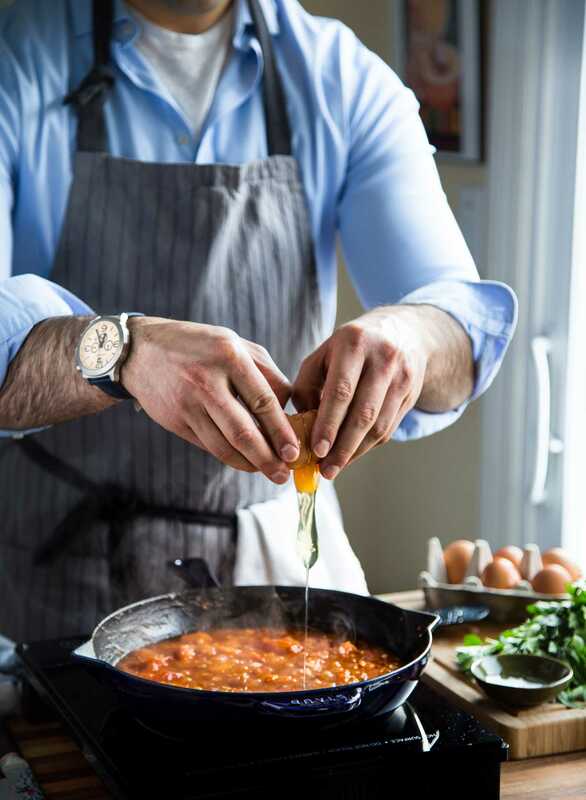 The reason being, I believe in the program, love the challenge of developing delicious recipes that fall within the limits of the food rules, and know that many people are constantly looking for recipes or inspiration to facilitate their own experience. It brings me an overwhelming amount of joy to know that this blog has become a small part of people’s health journeys. Impact is the ultimate reward and accomplishment that I can experience as a food/recipe blogger. I want you to know it’s not something I take lightly. 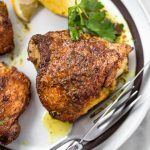 When I’m not doing a round of Whole30, I am following a Paleo blueprint. 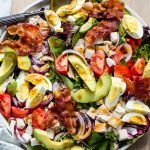 There are, of course, some overlaps between Paleo and Whole30 and this merits a separate blog post so keep your eyes peeled for that when I have some time to get around to it. Hopefully now that I don’t have a PhD deadline looming over my existence I will be a bit more productive on the blogosphere. 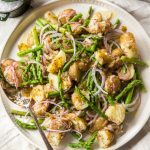 Having said the above, please note, this German Warm Potato and Asparagus Salad is neither Paleo nor Whole30 – but it can be both or either with a few simple adjustments! 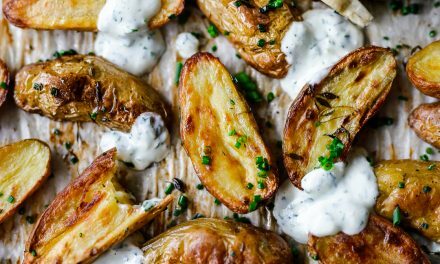 White potatoes are not an ingredient I would consider paleo, mostly due to their high-glycemic rating. In fact, I’m not sure I know anyone that would consider white potatoes paleo. Not that there’s anything wrong with that. A few years ago, I stopped eating white potatoes altogether. They have always been a gateway food for me. Something that triggers a switch inside my mind and sends me on a downward spiral consuming all the refined carbs in sight. It was only after my January 2018 Whole30 that I started to slowly reintroduce them. Much to my surprise, I found that I tolerated them very well. I had better control and didn’t feel lethargic after consuming them. My reaction to potatoes has been far better than white rice, which is not something I expected. 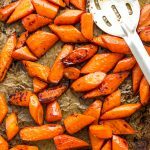 To keep things paleo in this recipe, try substituting Japanese yams. As opposed to the orange-fleshed sweet potatoes you may be familiar with, Japanese yams are white-fleshed with a purplish skin. 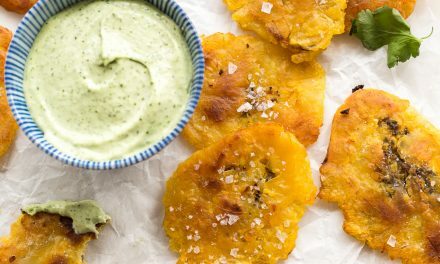 They are delicious, much less sweet than their orange cousins and make an excellent white potato substitute, both colour and texture-wise. Boil them whole to lock in the nutrients during the cooking process and peel them after. Proceed to cut them into cubes and add them to the salad along with the rest of the ingredients. The only adjustment you will need to make to keep things Whole30 is to omit the honey. That’s it, everything else falls in line with the rules of the program. See? Easy! Once potatoes are cooked, transfer to a cutting board and reserve cooking water. Cut potatoes into quarters and add to mixing bowl with dressing along with thinly-sliced onion. Gently toss everything to coat. Taste for seasoning and adjust as required. Add asparagus to pot used to cook potatoes. Blanch 90 seconds and transfer to ice bath 2-3 minutes to stop cooking and set the colour. 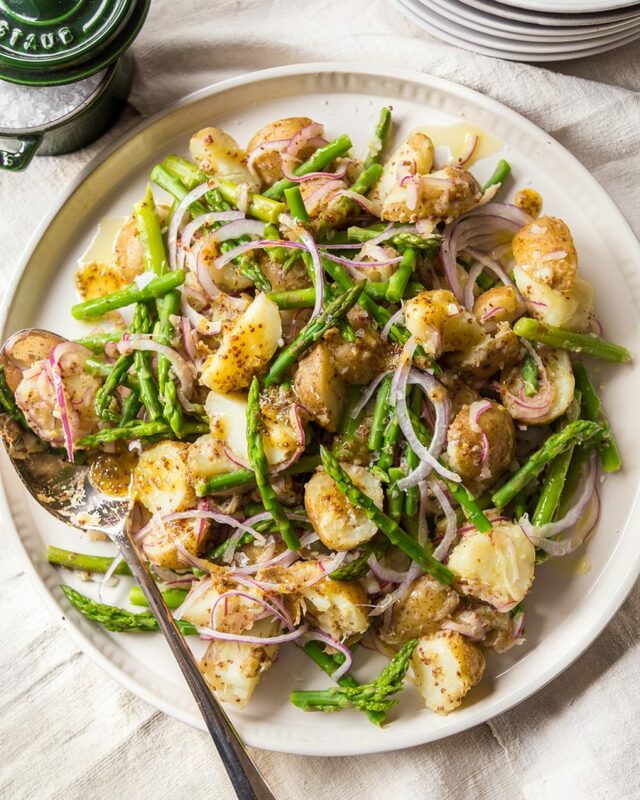 Drain and add asparagus to dressed potatoes. Gently toss once more to coat. Serve in bowl or transfer to a platter. Garnish with a drizzle more of EVOO and a pinch of flakey sea salt, such as Maldon. 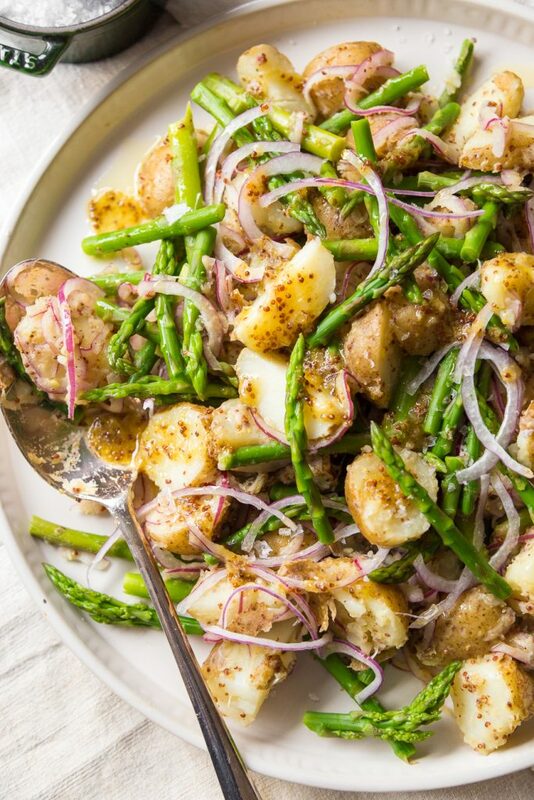 This German Warm Potato and Asparagus Salad is best served, well, warm. 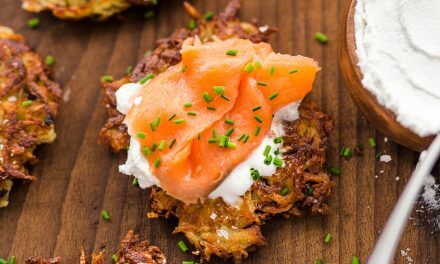 However, it can be prepared ahead of time and served at room temperature as well. You can also reheat it slightly in the oven before guests arrive. It can also be eaten cold the next day, making it a great option for a picnic!